THE European Union (EU) says the post July 30, 2018 poll killings and this year’s deadly fuel riots had harmed President Emmerson Mnangagwa’s efforts to win the powerful bloc’s support, as well as his quest to mend Zimbabwe’s broken relationship of the past two decades with the West, the Daily News can report. However, the EU adds, it will continue to engage in dialogue with Mnangagwa and his government — with the hope of helping Zimbabwe and its people to overcome the country’s escalating political and economic crises. In an address to journalists in Harare on Monday, EU ambassador to Zimbabwe, Timo Olkkonen, said the bloc had been appalled by the human rights violations in the country which had been attributed to security forces after the July 30, 2018 national elections and the fuel riots of early this year. “It has to be said that those were setbacks and in our perception … of respecting human rights and the rule of law … you can’t shy away from that. These are issues that we need to discuss indeed with the government. So, they have an influence … to an extent that while many hoped we could have engaged … perhaps concentrate our energy … on other issues such as economic co-operation, trade and investment … it shows that these issues about human rights … need to be addressed and discussed,” he said. This comes after the EU recently gave Mnangagwa and his colleagues in Zanu PF a stay of execution, when it decided against slapping them with further sanctions in the aftermath of the August 2018 killings and January’s deadly riots, which were sparked by fuel price hikes. However, the post-July 30, 2018 election shootings — which left at least six civilians dead when the military used live ammunition to quell an ugly demonstration in Harare’s central business district (CBD), and the dozens of deaths which occurred during this year’s fuel riots, as well as the subsequent vicious clampdown of dissenting voices — have dampened expectations that Mnangagwa will lift Zimbabwe’s lot anytime soon. Political analysts have also said human rights breaches blamed on security forces have dented the president’s international image significantly, in addition to harming his chances of getting financial support from Western countries. During the January protests, property worth millions of dollars was also destroyed and looted in the mayhem, after tens of thousands of workers heeded the Zimbabwe Congress of Trade Unions’ three-day strike call. Rights groups also reported other allegations of human rights abuses by security forces — including galling reports that soldiers had raped women and girls during their much-condemned crackdown against innocent civilians. Olkkonen said after the January mayhem, he had reached out to various interlocutors in the government, to convey the EU’s concerns about the need to stop the “violations”. He said despite these “setbacks” in their relationship with Mnangagwa and his government, the EU was still committed to the re-engagement efforts aimed at unlocking aid and financial support for Harare. 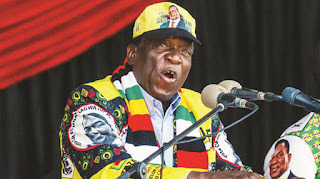 Last month, Mnangagwa and his under pressure administration were spared more pain by the EU which decided against extending sanctions despite a proposal by its Parliament which wanted punitive measures against the 76 year-old Zanu PF leader and many of his key lieutenants. However, the EU also warned then that although it had not taken its Parliament’s recommendations, for now, it would not hesitate to slap him and his key allies with sanctions if there were further human rights breaches in the country. “This decision was taken in light of our objective to encourage the rule of law as set out in Zimbabwe’s Constitution. We have seen a crackdown against demonstrators in January and the disproportionate use of force by the authorities, that called into question this commitment. “The key question is to understand whether the old system has been dismantled … or it remains in place under a different leadership. “All decisions on listings, including new listings, can be swiftly adopted if the situation requires it. We are monitoring the situation very closely and stand ready to adjust our decision,” EU spokesperson Federica Mogherini, said then. Zimbabwe is in the middle of a huge economic crisis which sparked the January riots. A severe drought and the recent horrendous destruction of key infrastructure and homes by Cyclone Idai — mostly in Manicaland — have left Mnangagwa and his government with even more social, political and financial stress. Mnangagwa has said that he remains committed to ending Zimbabwe’s decades of isolation by Western governments, by pushing ahead with his re-engagements efforts despite the alleged excesses by security forces. His government has since hired a top American reputation management firm — to spruce up Zimbabwe’s international image and to lobby President Donald Trump’s government in a bid to improve frosty relations between Harare and Washington. This comes after a disappointed Trump renewed America’s targeted sanctions against Zimbabwe for another year earlier this month — accusing Mnangagwa and his government of not doing enough to improve Harare’s democratic credentials since Mugabe fell from power in November 2017. The public relations company which has been contracted by Zimbabwe, Ballard Partners, is headed by prominent Washington lobbyist Brian Ballard — who is also said to be a top fundraiser for Trump’s political campaigns.